The final version of this article with its full bibliographical information is available. To access the article, click here (Vol. 36 (2019) pp. 145-155). Magnetite (Fe3O4) is one of the most important iron oxides due to its extensive range of application in various fields. The characteristics of magnetite can be considerably enhanced by reducing the particle size to the nanometer scale. When novel functions of nanoparticles are desired, it is necessary to have monodispersed or nearly monodispersed nanoparticles. Many synthesis methods have been proposed to produce monodispersed magnetite nanoparticles, including co-precipitation, sol-gel, hydrothermal and electrochemical methods. 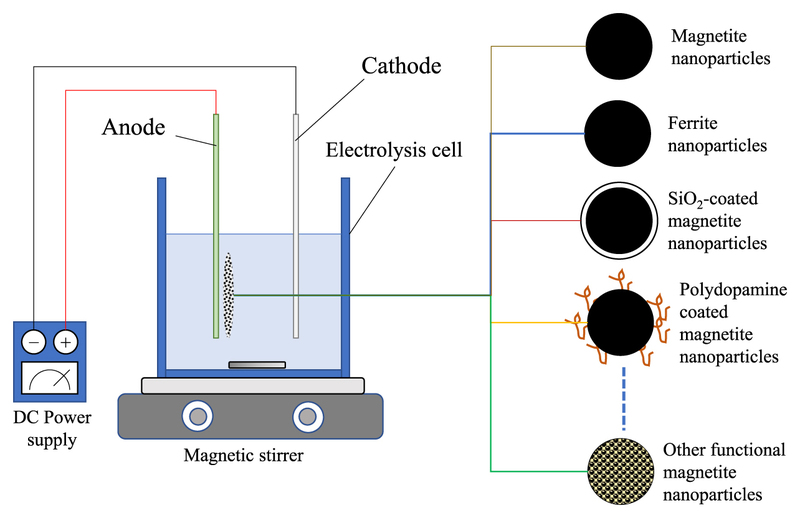 In this review, progress in the preparation of magnetite nanoparticles and their composites through the electrochemical method and the scale-up method are discussed.